Most Americans will pay more in taxes in 2013 because of the expiration of a payroll tax cut. 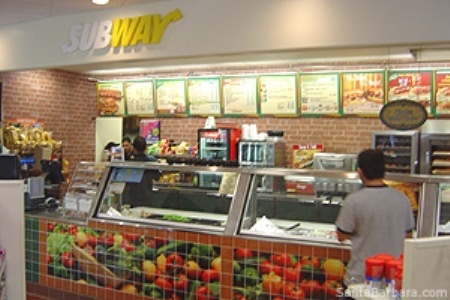 Subway workers in Detroit said they fell off fiscal cliff in their 2013 paychecks, while Subway went up on its prices. In a Web video, President Barack Obama leaves out some key facts about the fiscal cliff deal, possibly leaving the wrong impression about its impact on taxpayers and the deficit. Obama boasts that “middle-class families” will not have to “pay upwards of $2,000 more in taxes this year.” That’s accurate for income taxes, but Obama doesn’t mention that the deal allowed a payroll tax cut to expire. About 77% of taxpayers will pay more in taxes this year — nearly $1,200 more for those earning between $75,000 and $100,000, a group that fits squarely in Obama’s broad definition of middle class. 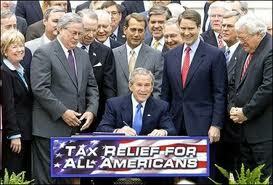 Bush signing his tax cut for the rich legislation. Obama says the agreement “will reduce the deficit.” In fact, the deficit will increase by about $4 trillion over the next 10 years because of the extension of the Bush tax cuts for all but those in the top 1% of taxpayers. The deal will “reduce the deficit” only compared with what it would have been if the Bush tax cuts had been extended for everyone. All the president’s talk about preserving middle-class tax cuts in the just-passed bill to avert the so-called fiscal cliff may give one the impression that, except for the wealthy, people will be paying the same amount in taxes this year as last. But that’s not correct. Left out of Obama’s analysis is that a temporary, two-year reduction in Social Security payroll taxes was allowed to expire. As a result, most people will actually pay more in taxes this year. He made no mention of payroll taxes in that press briefing. Nor is there a mention in the White House fact sheet about the fiscal cliff deal. And in a campaign-style video sent out to supporters, Obama says only that the deal spared middle-income households from a bruising tax hike. Obama, Jan. 2: You know my top priority has been preventing a tax hike that could have hit 98% of all Americans in 2013. Because the last thing middle-class families can afford right now would be to pay upwards of $2,000 more in taxes this year. It’s true that the deal spares middle-income earners the worst of the fiscal cliff tax hikes. The law is likely to raise $620 billion in new high-income revenues, mostly by allowing Bush-era tax cuts to expire for individuals making more than $400,000 and couples making more than $450,000 a year (that affects 1% of Americans, not 2%, as Obama said). But for people below that income threshold, the income tax rate will remain the same. That’s certainly a big deal. The non-partisan Congressional Budget Office projected that if all of the expiring tax cuts were allowed to go away, the nation would probably slide into a recession and the unemployment rate would rise to 9.1%. But Obama’s video — in which he leaves out the qualifier income tax — may lead many to believe that if they don’t earn upward of $400,000, they will not see a tax increase in 2013. And they may be surprised when they get their first paycheck this year to see that it is a bit lighter. That’s because a two-year reduction in the Social Security payroll tax — that pesky FICA line on your paycheck — was allowed to expire. As a result, those with income between $40,000 and $50,000 would pay an additional $574 in payroll taxes in 2013, according to the non-partisan Tax Policy Center. Those with household income between $75,000 and $100,000 (still solidly middle-class by Obama’s definition) would pay an additional $1,194 in 2013. Allowing the payroll tax to go back up to 6.2% from 4.2% will mean an average tax hike for all Americans of $721 over the course of 2013. That’s $60 a month. Overall, the Tax Policy Center estimates that 77% of Americans will be paying more in taxes in 2013 than they did in 2012. “For most, the only reason is because of the payroll tax,” said Roberton Williams, a senior fellow at the Tax Policy Center. Many politicians do not view that as a tax hike, but rather as simply the expiration of a two-year tax cut that was always designed to be temporary. Extending the payroll tax cut was not part of Obama’s 2013 budget. But whether it was part of the Obama administration’s initial fiscal cliff proposal is a bit fuzzy. As we reported on Dec. 5, the president’s opening offer in the fiscal cliff negotiations included $200 billion in new stimulus spending. At that time, Treasury declined to give us a detailed list of proposals for new spending, but it did confirm published reports that some of the elements of the stimulus plan might include an extension of the Social Security payroll tax holiday, as well as infrastructure spending. Those were not part of the law that passed. One could argue the Bush tax cuts were also temporary, but only because Republicans didn’t have enough votes to make the tax cuts permanent when the legislation was approved in 2001. 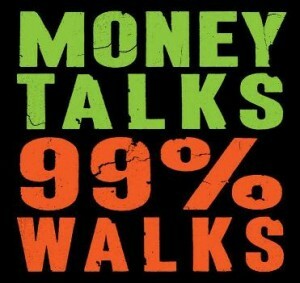 And so they were enacted for nine years, with Republicans expecting that the cuts would ultimately be made permanent. And then they were extended for another two years by Obama and Congress. As for Obama’s claim that the fiscal cliff deal will reduce the deficit, that depends on one’s baseline assumption. The deficit is smaller than it would have been if the Bush tax cuts had been extended for everyone, including the wealthy. But it is larger than if the Bush tax cuts had been allowed to expire for everyone as scheduled at the end of 2012. Among budget experts, it is the difference between starting with a baseline of “current policy” — which assumed the Bush tax cuts would have been extended for everyone, as they were in 2010 — and “current law,” which called for the expiration of all the Bush tax cuts on Jan. 1, 2013. Assuming “current policy,” Obama is able to claim the fiscal cliff law reduces the deficit, mostly by increasing high-income revenue by $620 billion. But assuming “current law,” the deal actually increases the deficit by nearly $4.6 trillion over 10 years, according to the Congressional Budget Office — because it permanently extends the Bush tax cuts for most taxpayers. Obama is trying to have it both ways, as he toggles between the two assumptions. By assuming the tax cuts would have expired for everyone without his action, the president claims credit for averting an income tax hike for middle-income taxpayers. But, in order to take credit for cutting the deficit, Obama is assuming that the tax cuts would have been extended for everyone. VOD editor: Across the world, as in Detroit, working and poor folks must build a movement to challenge the global banks and corporations that are behind the devastation of our societies. 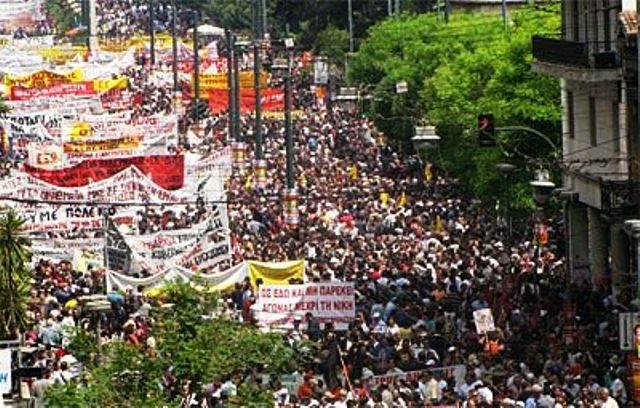 Mass protest in Greece against International Monetary Fund austerity demands.